Donna "The Daiquiri Queen" brings Tom and Frank a few daiquiris after FPB's gig in Waterloo, NY on January 24, 2009 concluded. 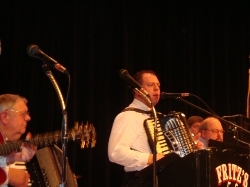 Frank, Fritz, and Mike are pictured here during FPB's gig in Waterloo, NY on January 24, 2009. Tom tears it up on the dance floor with a couple of young FPB fans during FPB's gig on January 24th at the St. Mary's Fundraiser in Waterloo, NY. The guys in FPB along with special guest drummer, Mike Faraino, tear through a tune during their second set at the St. Mary's Fundraiser on January 24, 2009 in Waterloo, NY. Gabe with his Parker during FPB's gig on January 24th in Waterloo, NY. Special guest drummer, Mike Faraino gives out a pair of drumsticks to a Fritz's Polka Band fan in the audience on January 24, 2009 in Waterloo, NY. Tom and Fritz are shown here in Waterloo, NY on January 24th. Tom is greeted warmly by Donna on January 24th at the St. Mary's Fundraiser. Gabe, Tom, Frank, Mike (special guest drummer), and Fritz have a Jagermeister toast before their first set on January 24th in Waterloo, NY. 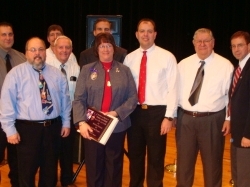 Special guest drummer, Mike Faraino and the guys in Fritz's Polka Band are pictured here with Congressman Mike Arcuri, who's standing behind Sue Sigsbee (with her son's Order of the Purple Heart Award), and FPB's good friend, New York State Senator, Joe Griffo, after the Corp. John P. Sigsbee Post Office Dedication concluded on January 16, 2009, in Waterville, NY. 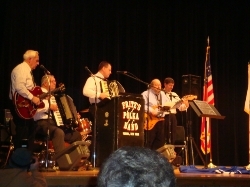 Fritz's Polka Band is shown here on January 16th at the Corp. John P. Sigsbee Post Office Dedication. 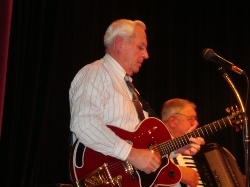 (photo courtesy of Sue Sigsbee) Fritz's Polka Band performs 'Tribute' during the Corporal John P. Sigsbee Post Office Dedication on January 16th in Waterville, NY.